As promised, Google is beginning to build out Google Fiber in two cities: Kansas City, Kansas and Kansas City, Missouri. When completed, the new city-wide networks will tether citizens to a fiber-optic backbone capable of delivering 1Gbps Internet to tens of thousands -- if not hundreds of thousands -- of people. Google says it has measured utility poles, studied maps, surveyed neighborhoods and eaten way too much barbecue -- but the company has since completed its planning phase and is now stringing thousands of miles of fiber-optic cabling along telephone poles. There is no word how much a Google Fiber subscription will run, but the company claims it will be offered at a "competitive price" to as many as 500,000 people. 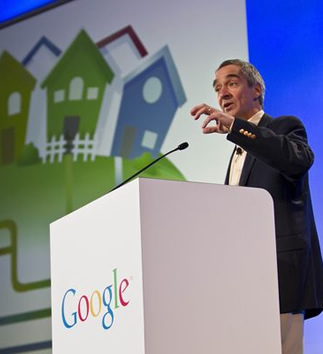 At 1Gbps, Google Fiber is unlike any other Internet plan offered to residential customers in the United States. It will be 10 to 20 times faster than competing fiber-based services, like Verizon's FiOS, and more than 100 times faster than the typical household connection most Americans enjoy. Kansas City -- both of them -- were hand-picked by Google based on a number of criteria, including a plethora of personal appeals they received from over a thousand cities nationwide. To catch the search giant's attention, cities performed a number of gimmicky publicity stunts like promising to tattoo their mayor and even renaming the cities themselves to Google. In one instance, the company even returned the favor and temporarily rebranded itself "Topeka" for April Fools' Day. The U.S. is often criticized for lagging behind other countries when it comes to broadband proliferation, speed and price. In September, we reported that the U.S. was ranked 26th by Pando Networks in terms of broadband speed.